1. Place the couscous in a large bowl, pour in the stock, cover with clingfilm and leave for 5 minutes. 2. Meanwhile, wilt the spinach for 2-3 minutes according to pack instructions, then drain the excess juice. 3. Heat the beans for 1-2 minutes. 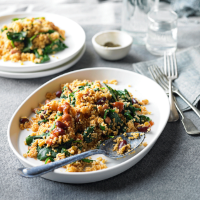 Fluff the couscous with a fork and stir in the spinach and beans.